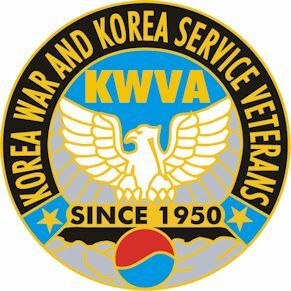 Chapter 169, KWVA of Lake County (FL) has produced a Don Struhar*-designed Korea War and Korea Service Veterans lapel pin that not only is very nice for members to wear, it also makes a nice gift to friends and family, especially to grandchildren. These 3/4ths-inch diameter pins were produced by a high quality manufacturer who has done other KWVA pins, and are being offered to all KWVA members for $4.00 per pin. Shown at left are the design graphic (top) and a photo of the pin on a jacket (bottom). Chapter 169 invites all KWVA Chapters and Departments to advise their members about the availability of these pins, and suggests Chapters consolidate orders to reduce shipping and handling costs. Any KWVA Member may order independently by following the instruction herein. We only ship pin orders by Priority Mail® Small Flat Rate Box. Hence Shipping and Handling is $6.00/order (but free on orders for 25 or more). * Don Struhar is the artist who also designed the DoF Patch and the Korean War and Korean Service Veterans Association logo.